All training participants are entitled to attend CPR's Annual Meeting's Friday and Saturday sessions for free. Take advantage of this full week of Power ADR! Welcome to the "CPR DateBook," in which we periodically provide you with details on CPR's upcoming events in one place for easier planning purposes. 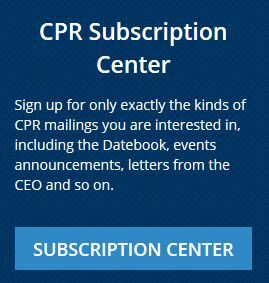 These mailings will also contain helpful tips, highlights and links to breaking CPR news and initiatives, as well as CPR resources you may want to explore or revisit. CPR is always hard at work to provide information and other tools to help you advance your dispute resolution goals. To print the DateBook, first open it in your browser here. What's Next for Employers, Post Epic Systems? On January 23, CPR's Energy, Oil and Gas Committee hosted “Cocktails and Conversation" at BakerHostetler's event space in Houston. More than 100 people attended the event, which took place on the Wednesday before the ITA International Energy Arbitration Conference. Moderated by BakerHostetler Partner, Sashe Dimitroff, the panel of in-house counsel discussed the powerful impact of ADR as it continues to evolve in the energy sector. See below for a photo of our panel. From left to right: Sashe Dimitroff, BakerHostetler (moderator); Raj Duvvuri, Marathon Oil; Mimi Lee, Chevron Upstream; Laura Robertson, ConocoPhillips; and James Kerr, Southern Company. The problem for this year's competition has just been released and is now available on the competition webpage HERE. This year, the competition problem – "Decipher Me and Devour Me" – involves an agri-business dispute opposing TUPI FRUIT EXPORTS LTDA. (“TFE”) and AGRITECH FRUIT WHOLESALERS, Inc. (“AFW”) arising out of a Purchase & Sale Agreement for the supply of figs. Smart contracts and blockchain are also involved. Thanks go to the authors of the problem Fernanda Levy, Alexandre Simões, Claudia Frankel Grosman, Denise Shaw and Patricia Freitas Fuoco. The problem is now in the hands of the 92 participants – students and coaches – who will participate in this year's competition. NEW: February 23, 2019 - Harvard International Arbitration Conference, “Arbitration in a Complex World: Challenges and Perspectives of Modern International Arbitration.” CPR is an institutional partner of this event. February 25-28, 2019 - CPR/CEDR Advanced Mediation Skills Training at BakerHostetler, Washington, D.C.
February 28 - March 2, 2019 - CPR's Annual Meeting, Washington, D.C.
NEW: May 7, 2019 - CPR Banking & Financial Services meeting featuring Hon. Robert D. Drain, United States Bankruptcy Judge for the Southern District of New York. Lunch will be served, starting at 12:15 pm. Location to be announced. May 13 -17, 2019 - Columbia Law School/Chartered Institute Comprehensive Course on International Arbitration, Hogan Lovells, New York - A week-long systematic and comprehensive examination of the law and practice of international arbitration.The course features lecture and interactive segments and is designed for arbitrators, advocates, in-house counsel and others interested in international arbitration. NOTE: Early registration discount ends April 12, 2019. February 4, 2019 – CPR Canada Advisory Board in-person meeting from 2:30-4:30 pm at Fasken in Toronto. (CAB Members Only). *Through CPR's collaboration with CEDR, CPR members and Distinguished Neutrals can receive a 10% discount on CEDR Mediation Skills and Employment and Workplace Courses. Before registering, contact sslattery@cpradr.org to receive your discount code.